Monday, September 03, 2018 - This guy caused drama at a popular reproductive health clinic where his pregnant girlfriend had gone to procure abortion. It appears the lady had discussed the matter with him but the guy made it clear that he was against it. The lady had made up her mind and went to the clinic with her side guy. 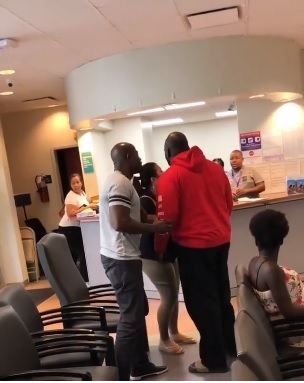 Hell broke loose when the main guy stormed into the clinic and forcibly ejected his girlfriend from the clinic. While this looks like a skit, it has revived the debate on abortion. The pro-choice army reckons that a woman has a right to do whatever she deems with her body including ending unwanted pregnancies while the pro-life brigade insists abortion is nothing but murder for convenience.